Racing drones, also called FPV drones or racer drones, are used in amateur and professional drone races. Flying these drones, fast and highly maneuverable, require a lot of skill. There are hundreds of models available and it’s not always easy to find the best FPV racing drone in this fast moving market. After our extensive research and in-depth reviews, we’ve put together our selection of the best racing drones and included some tips and knowledge for better understanding racing drones. What is an FPV racing drone? What is the best FPV racing drone in 2019? 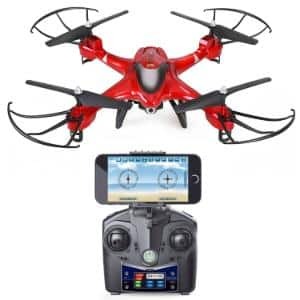 An FPV racing drone is generally a small quadcopter drone or unmanned aerial vehicle (UAV) which is specifically designed to be durable, light, and fast. The drone offers FPV (first person view) for the drone pilot to operate it usually through goggles or a headset. Like all fast-moving emerging technologies, drone racing is progressing by leaps and bounds every year, as a professional sport and as a hobby. Improvements have been made across the board on all the technological components that comprise the first person view (FPV) drone racer. Therefore, new FPV drone models from established brands, lesser-known manufacturers, and bespoke drone racing suppliers are seeing progressive improvements in performance, speed, and durability. As a consequence, racing drones are becoming more affordable. The rise in popularity of the sport of drone racing also means that the market has been flooded with options for experienced drone pilots who tend to custom-build their ideal performance-winning drone. Furthermore, drone enthusiasts and beginners to drone racing have a bigger selection of models than ever to choose from. Some previously lesser-regarded Chinese manufacturers have also upped their game and the quality of their products. Finally, a number of FPV drones now see year-on-year upgrades or updates as manufacturers are listening to and reacting to the feedback from the drone community to enhance the drones. We have therefore scoured the internet and highly respected online sources to compile an overview of a selection of the best available FPV racing drones, including – where possible – new versions of highly rated models. This table represents our selection of some of the best FPV racing drones available on the market. These FPV racing drones are selected according to a combination of available metascores, indexed from reliable sources (TechRadar, WIRED, CNET, and Amazon) and our research into trusted user and community feedback. We haven’t tested all of the FPV racing drones in this list. For more information on our methodology, read here about how we work. Below is more information about the best FOV racing drones we've selected in our list, including, specs and important features. This FPV racing quadcopter is the first commercially available racing drone from the limited series paying homage to the DR1 (drone racing league). With a light and durable build, a high resolution 600 TVL camera and shipping with the Fatshark 101 controller, the MICRO DR1 is highly anticipated. Larger 3” and 5” versions are also available. 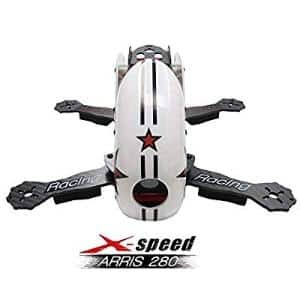 With its carbon fiber design, ARRIS S2205 2300 KV brushless motors as well as the HD FPV 700 TVL camera, the X-Speed delivers a powerful racing drone package. In addition, drone pilots can easily switch between self-level and manual (Acro) modes with the Radiolink AT9S transmitter flight controller. This affordable FPV racing drone is perfectly suited for beginner drone pilots by offering SAFE (Sensor Assisted Flight Envelope) technology. The Inductrix BL is a Build-N-Fly racing drone thus users will need to buy controller, battery and FPV goggles. A neat feature is the Meow™ mode which will return the drone to an upright position after a crash. Diatone adds to its range of highly-regarded racing drones with the 2018 GT 530. Featuring Edge racing 2306 2450 KV brushless motors and a light and durable build consisting of composed carbon fiber allows it to be a quick, reliable FPV racing drone. The racing drone comes as an RTF and a Plug-And-Fly version. 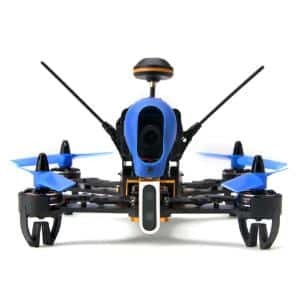 This affordable FPV racing quadcopter drone is fast and maneuverable, which also features an integrated FPV system which allows users to better control and operate the racing drone at fast speeds of 95 kmh. In addition, the drone has a great flying time of around 12 minutes. This excellent FPV racing quadcopter drone is BNF, however it features high-grade EMAX LS2206 2300kv brushless motors and 5-inch AVAN Flow propellers. The Hawk 5 is reported to reach speeds of over 100 mph and also includes a HD Foxeer Arrow Micro V2 600 TVL camera. 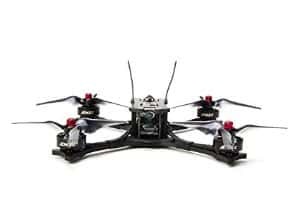 The X215 PRO has the trademark FuriBee X-frame in addition to a 3K carbon fiber build. In addition to its light & strong build, it is powered by high-performance 2206 2600KV brushless motors which allows this FPV drone to reach speeds of 130 kmh. An HD 1200TVL CCD camera is also included. 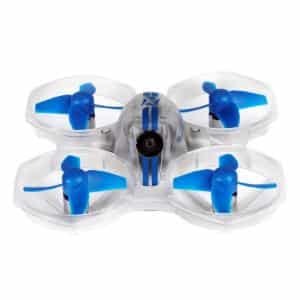 Although the Holy Stone HS200 targets beginner drone pilots with flight features such as headless mode, one-key takeoff and landing, and return home, it is also a stable fast racing FPV drone. Users can also operate the drone via Wi-Fi and through the use of an app. This inexpensive and popular drone is also perfect for newbie drone racers with its range of pilot-friendly flying features. Although it is not the fastest drone (45 kmh) the Holy Stone HS230 is a perfect stepping stone drone for new pilots who can also enjoy the easily performed tricks. A cheap but highly recommended FPV racing drone, the H122D X4 Storm from Hubsan is very robust and durable to withstand crashes. It is another great drone for less experienced drone pilots which can also be operated via a smartphone app. 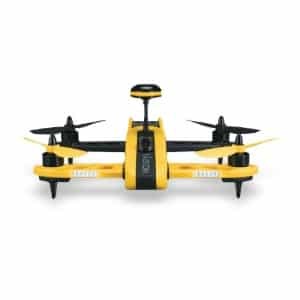 One of the most affordable racing drones on our list, the Remoking RS6 drone impressively features a 6-axis gyro stabilizer to offer in-flight stability and ease of use for drone pilots. Furthermore, an HD camera, Wi-Fi connectivity, and access via a mobile app are impressive for the low price-point. The Vusion 250 V2 is injection molded to offer added strength while the 2280kV brushless motors provide power and reliability. The 600 TVL FPV video camera also offers fantastic real-time footage. The modular design allows users to easily replace parts on the drone. 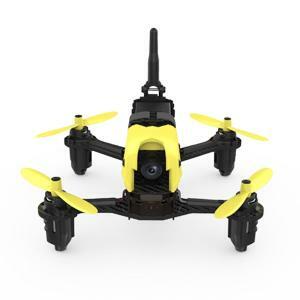 The SWAGDRONE 210-UP is built from carbon fiber and is an RTF (ready-to-fly) FPV racing drone. 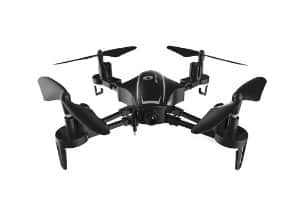 Some great features include the optimized night vision camera (700 TVL camera with a 120° field of view) as well as the location mode, allowing drone pilots to easily find it after a crash. 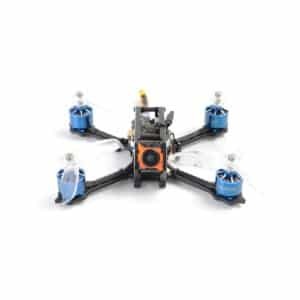 The F210 D is has a carbon build frame and features WK-WS-28-014A KV2500 brushless motors. It is also capable of flying 5 to 8 minutes while the 700TVL camera allows for HD night vision FPV experiences. The DEVO 7 remote control and drone allow for a very intuitive flying experience. 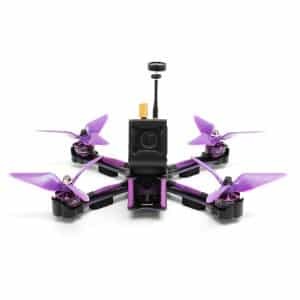 Some well-known drone manufacturers have recently released new FPV racing drones which, on early review, look like they could be FPV racing drones to keep an eye on. The Draco 4×4 from UVify was announced and unveiled at CES in January 2019 and features an incredible 16 motors, with 4 on each arm of the quadcopter. The FPV racing drone will feature in the 2019 DR1 Racing League and expected to be fast and powerful as well as very maneuverable. EACHINE produces a large number of drones and FPV racing drones. The Wizard TS215 boasts superior battery capacity and speed compared to the X220S (which features on our list). Due to its reasonably late release in 2018, it has not yet secured a metascore. The drone community and popular YouTubers feedback on the KOPIS 2 SE is positive, with the brushless FPV racing quadcopter drone also including Blackbox logging and SmartAudio. The great price-to-performance ratio also makes it seem like this FPV racing drone could be a great addition for drone racing pilots. Team BlackSheep (TBS) is another well-regarded racing drone manufacturer and their TBS Vendetta 2 features on our list already. 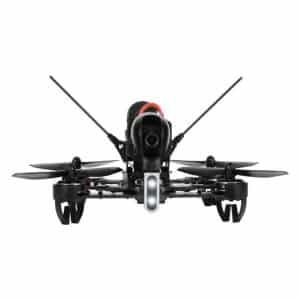 The OBLIVION is unique in that TBS claim the quadcopter is the first ever injected composite polymer unibody racing drone. In addition, it comes in a boxed frame for increased rigidity, can reach high speeds (120 km/h) and offers a decent flying time of 11 minutes. The 2019 GT-Rabbit R249 is a late 2018 release from popular Hong Kong manufacturer Diatone, which is also well represented in the US, features Mamba racing 1105 5500KV motors and an interesting plastic canopy. Furthermore, the 2019 GT-Rabbit R249 is a powerful FPV racing drone that has improved cameras and controller options compared to the Tyrant S 215. A number of racing drone leagues have taken prominence since around 2015. The DRL: Drone Racing League is the most prominent but other key drone racing leagues include the DCL: Drone Champions League, MultiGP drone racing, Rotor Match League, FREESPACE Drone Racing. The Drone Racing League is the premier professional elite drone global racing league. The first season on the DRL took place in 2016 and it is broadcast on several major TV networks such as ESPN, Sky Sports, FOX Sports Asia, and Disney XD. The number of drone pilot racers is limited to 10 (18 pilots compete but only the top 10 qualify for the DRL Championship). Furthermore, drone pilots can earn up to around $100,000 per season, making the Drone Racing League particularly attractive for professional drone racers. An interesting point: the 2019 series sees the introduction of AI-powered drone racing, also known as Artificial Intelligence Robotic Racing (AIRR). In this format, autonomous drones race against each other, with the season consisting of four self-flying drone races. In the season finale, human-piloted drones compete against AI-powered drones. What is the fastest FPV racing drone? The DRL RacerX from the Drone Racing League set the Guinness World Record for the fastest ground speed in 2017. The official speed was recorded as 163.5 miles per hour, which is the fastest verified speed for a battery-powered remote-controlled quadcopter (although it is reported that the top speed can reach 179.6 mph). However, the VXR-190 drone is also alleged to have reached speeds of 172 mph (unverified). A small selection of drones are able to reach speeds of over 100 mph with many FPV racing drones able to reach speeds of between 70-100 mph. Important information: drone pilots in the Drone Racing League exclusively fly the RacerX and Racer3 racing drones, both manufactured by the League. There are numerous drone components that contribute to the overall performance, durability, and price-point of the FPV racing drone. In this article we list some of the key aspects to consider when buying an FPV racing drone. Brushless motors are highly favored by the top racing drone pilots and experienced drone users. This is because brushless motors experience less wear, last longer (more durable), require less maintenance and are generally more reliable and efficient than non-brushless motors. However, brushless motors are also more expensive than brushed motors. FPV drone goggles are the preference of all top drone racing pilots and experienced drone users. The general consensus is that the drone is easier to operate via FPV goggles due to the line of sight it offers from the front of the drone (or the position of the camera on the drone). Drone pilots will seek the best FPV racing drone with full kit and goggles. 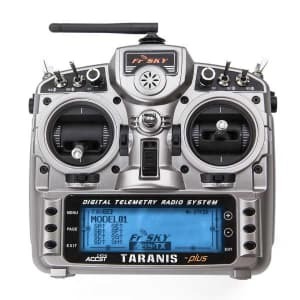 Other gear to consider are the FPV video transmitter, antenna, video monitor (which could be the RC controller’s LCD display or a smartphone) and the camera (ideally High Definition). 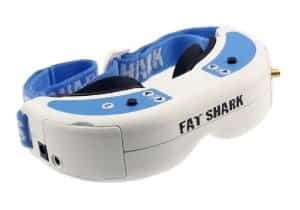 Some brands such as Fatshark are highly regarded for their FPV racing goggles. The range of options in selecting the transmitter is forever increasing within drone racing. Aside from compatibility issues, the combination of antenna, control receiver, flight controller, etc. all play a pivotal part of the puzzle to achieve maximum performance. Furthermore, drone pilots now have a broader range of memory selections, OSD (On Screen Display), and software updates to factor in their decision-making process. Ease of use as well as comfort, adaptability, range, and the link between the FPV headset are elements that will impact the drone pilot in choosing the right flight controller for them. The motors power (brushless vs. non-brushless as discussed above) is typically expressed in Kv, the meaning constant velocity of a motor and measured in thousands of RPM (rotations per minute) per volt. Careful: Kv does not stand for Kilovolt in this case! The amount of power required for peak performance is mainly linked to the size and weight of the drone. Guidelines suggest 1000-2300Kv will be plenty for a 250mm (diagonal size) racing quad. The categorization of the motors can be identified by their four-digit number, e.g. 2205: “22” indicates the width and “05” the height. Ready-To-Fly (RTF): all necessary elements are included in the package. Bind-N-Fly (BNF): contains everything but the transmitter. Plug-N-Fly (PNF) our Plug-N-Play (PNP): does not include the transmitter, the receiver, the battery and charger. Professional racing teams and pilots tend to custom-build their FPV racing drones, piecing together the best components where possible, very much in the mold of tinkerers and makers. Many elements of a racing drone can also be modified physically (parts and components) or electronically adjusted (e.g. settings). Those can be more advanced and complex but top racers are constantly looking for any advantage and new equipment to give them an edge. However, novice users are encouraged to start with an RTF drone and build up their experience, and patience, as crashes are inevitable. Speed and power: Top racing drones can reach over 100 mph but most will fly at around 75 mph. Frame material: The best racing drones are generally built from carbon fiber or a composite with enforced protection for the camera, battery strapping, etc. which may come loose during a crash. 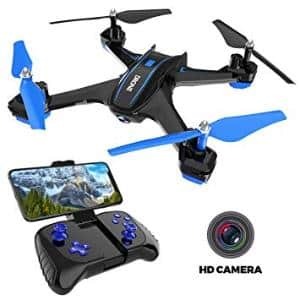 Camera quality: Ideally the camera quality is high in a FPV drone, as the image quality will dictate how easy it is for the drone pilot to see the streamed video on-screen or via the FPV goggles. 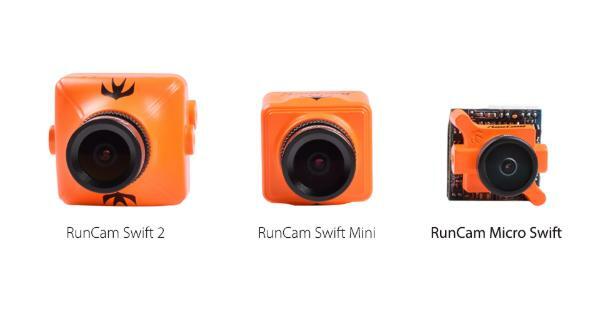 Popular cameras are those such as the RunCam Swift, but a number of high-quality cameras are available for between $20 to $50. Flight time: Most FPV racing drones are only able to endure a flight time of a few minutes (5-6 min.) with a few exceptions. A lot of elements have to be factored in and could affect this duration, e.g. battery, motors, weather, etc. As it was mentioned earlier in the article, drone racing and recreational/hobby drone users are on the rise. One of the benefits of drones is that there is a very large price range involved that allows beginner drone pilots to quite easily purchase their first drone at a minimal cost. However, once a drone hobbyist is hooked on the sport, the likelihood is that they will purchase several drones, upgrades, and accessories, and with the rapid progress of the performance of drones, this could then require a yearly investment. This is a key performance factor for racing drones which are designed to be highly reactive and maneuverable at high speeds. However, multiple characteristics of the drone can impact the maneuverability of the FPV racing drone. These can include the RC controller response time (and line of sight), weather conditions, the balance of the drone, lift power, etc. 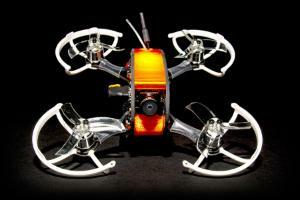 Smaller, more compact racing drones tend to be more durable than larger, heavier drones. The build and material of the drone (carbon fiber for example), speed of the crashes, blade protectors, skills of the pilot, etc. will all impact the racing drones’ durability. This is also mainly in reference to the main frame of the drone, which tends to be the strongest part, whereas other elements such as the camera or propellers may experience more damage during high-speed crashes. Most racing drones don’t perform well in poor (windy or rainy) weather, so indoor FPV racing is often preferred. Furthermore, some drones can struggle when flying over bodies of water. Racing drones also don’t have features which aerial photography drones may have, such as GPS, “return to home” modes, or obstacle avoidance. Thus, it is quite easy to lose your drone! For FPV racing drones, there are the added limitations of a minimal flying time, which is relatively short at around 4-8 minutes. That being said, racing drones can be incredibly fun and there is a very large drone and UAV community which can be accepting to users of all levels and promotes the sport in meetups (online and in the real world). Finally, always research your local and national laws on drones as these vary in every country. How much do FPV racing drones cost? The price range for FPV racing drones is quite large as many racing drones come in kits. This allows drone pilots to build a drone with their preferred components. However, RTF (Ready-To-Fly) racing drones can cost as little as $200 USD for beginners and up to $1,000 for more advanced FPV racing drones (which includes some spare parts). How far can FPV racing drones fly? The range (distance) of FPV racing drones is nowhere near as far as the range for advanced photography drones which can be 2-3 miles. This is largely due to the limitations of the FPV headset range and battery life, which in particular is shorter than those of camera drones. As a result of relying on radios operating on the default 2.4gHz range (which is standard to most racing drones), 1 kilometer would be considered a great range for FPV racing drones. How much do FPV racing drones weigh? A weight of under 200 grams (including the battery and camera) would be considered very light for a FPV racing drone. Most drone racing pilots would aim to have their drone weigh under 400 grams. The weight also depends on the class of racing drones. What size are FPV racing drones? There are various classifications of drones such as micro, mini, and others. Micro quadcopters can be assumed to be 150mm (diagonally) and smaller while the mini quadcopter drones are between 150mm and 300mm. Are FPV racing drones hard to fly? Drone racing is a technical sport and thus it takes time and practice to acquire those skills to become a good racing drone pilot. There are many factors to consider whether FPV racing drones are easy to fly. These include the specs of the drone itself, the controller (and its ease of use), potential interferences and latency in controls, and external factors such as the weather. As with anything, practice makes perfect, and more experience will make it easier for drone pilots to fly a drone. The FPV is very community-based so we advise beginners to do their online research and ask online groups for help. Can you make money racing drones? The top professional racing drone pilots compete in the Drone Racing League and they can earn up to $100,000 per season. A new Artificial Intelligence Robotic Racing (AIRR) Circuit launches in 2019 which sees four AI vs. AI drone races with the winning team earning $1 million. Paul “Nurk” Nurkkala ss the 2018 DRL Allianz World Champion while Jordan “Jet” Temkin has won the DRL Allianz World Champion twice. Find out all you need to know about drones in our drone buying guide. We reference over 75 drones in our database to fuel our drone comparison engine. Discover the best 4K camera drones. Find out how to 3D print your own drone.